Have areas of your roof developed black streaks? If so, you are not alone. Many think that this discoloration and roof staining is a result of pollution, dust ,dirt, pollen or tree sap settling on your roof. Roof staining is caused by algae growing on your roof shingles or tiles, which is a result of the humid climate in Clearwater Fl St Pete / Tampa Bay Area. Other terms for these black streaks include roof moss, roof fungus or roof mold. Note: Tile Roof below has been damage by Pressure washing removing protective finish and paint!! Apple roof cleaning Of Pasco & Pinellas, can make your roofing tiles or shingles look new again, while extending the life of your tile’s / shingles. We use a Non-pressure chemical roof cleaning process and apply our soft wash roof cleaning Chemicals with no more pressure than what typically comes from your water hose. Once applied, our soft wash roof cleaning chemicals will remove the darkest roof stains in minutes! A pressure washer should never be used to clean any type roof! 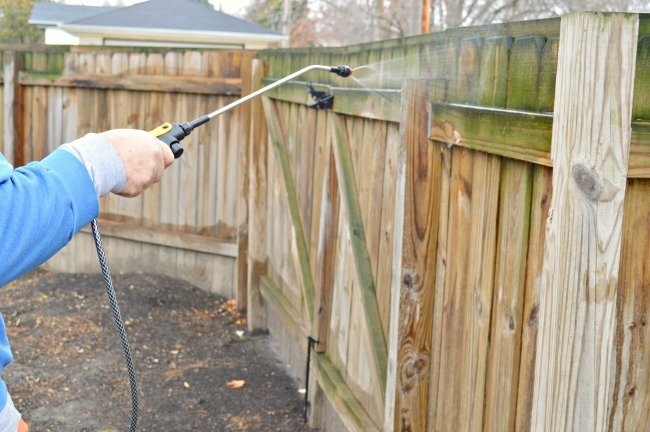 The high pressure washing systems that utilize a pressure washer will dislodge large quantities of the protective granules covering your shingles (or remove the clear coating on tiles) and leave your shingles vulnerable to the elements. 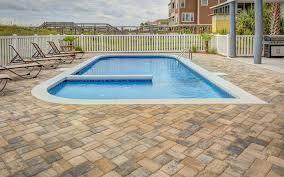 This will lead to early roof failure and void any warranty that you may have on your tiles or shingle. You are in a select group of home owners that have avoided the costly learning curve of removing the black roof stains from your home. The number one problem in this relatively new industry is education. Many roofing cleaning contractors and product sales companies are taking advantage of uneducated home owners, costing them hundreds of dollars in useless or some times damaging services by pressure cleaning their roofs . 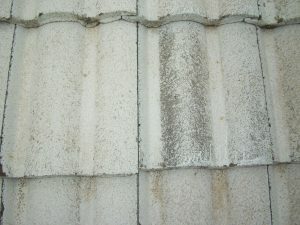 Pressure cleaning roofs can damage shingles and destroy the factory finish on the tile. In extreme cases, homeowners can spend thousands of dollars in unneeded roof repairs or replacements!! As part of normal roof cleaning service, tiles our often cleaned to remove algae, fungus and roof mold. The skill of the individual doing the roof cleaning and how the roof cleaning method is employed, will determine the ultimate appearance of your roof. Roof cleaning requires an experienced individual who understands what they are doing. When done by a professional your shingle or Tile roof can look new, but when done by an amateur the damage can be irreparable. Furthermore, if the individual is inexperienced in walking on roofs they may break tiles or fall and suffer serious injury. . Roof cleaning is a job for professional roof cleaners who are experienced with roof tiles and roof cleaning chemicals! Allowing an inexperienced individual on your roof is a risk not worth taking. Apple Roof Cleaning has become a household name in Pasco, Pinellas & Tampa Florida we’ev been cleaning roofs in the Tampa bay area since 1999. Give us a call! Our prices are hard to beat!! Soft wash Roof Cleaning services areas of Pinellas County Florida Tarpon Springs FL Palm Harbor FL and Tampa FL. Give Us A Call Today For your Free Roof Cleaning Estimate!! We specialize in all types of roof cleaning services. We use a soft wash chemical roof cleaning system on roofing materials including Asphalt, Tile, T.P.O., Durlast, Slate and Wood Shake. What does soft wash chemical roof cleaning mean? It means we use chemicals to clean (soft wash spray) it kill bacteria, mold, algae, moss and mildew on contact!! Apple Roof Cleaning Of Pasco & Pinellas only uses chemicals approved by the Asphalt Roofing Manufactures Association (ARMA). What does this mean for you? Better curb appeal, reduced utility bills!! Removing the black mold from your tile or shingle roof can lowers electric bills!